Alaska’s Arctic National Wildlife Refuge is one of our last truly wild places — and it has been off-limits to oil companies for decades. But right now, the Trump administration has put us closer than at any time in history to tearing open the Arctic Refuge for destructive oil and gas drilling. Drilling in this spectacular place would decimate one of the last unspoiled ecosystems on earth. It could be a death sentence for polar bears, caribou, and other imperiled wildlife, and threaten the culture and survival of the region's Gwich'in people. We must do everything we can to stop this disastrous plan in its tracks. 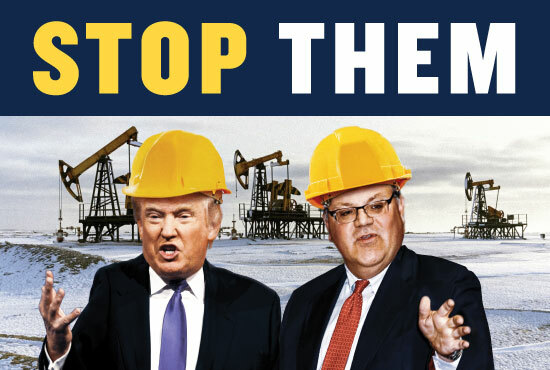 Rush your message to President Trump and Interior Secretary Bernhardt telling them you strongly oppose destructive drilling in the Arctic. Alaska’s Arctic National Wildlife Refuge is one of our planet’s last truly wild places. But President Trump and Interior Secretary Bernhardt are on the verge of destroying it forever. Help fight back by telling them you oppose destructive oil drilling in the Arctic. Dear President Trump and Interior Secretary Bernhardt, I am opposed to your plans to open the Arctic National Wildlife Refuge to oil and gas exploration. This natural treasure belongs to all Americans and is not for sale! We will not allow our Arctic heritage to be destroyed to enrich oil companies and produce more climate-wrecking pollution. As one of the last truly unspoiled wild places on earth, the Arctic Refuge is irreplaceable. Imperiled polar bears, wolves, musk oxen, and countless other wildlife depend on the Refuge, and it's a vital sanctuary for millions of migratory birds from around the world. It is also the birthing ground for the Porcupine caribou, which is central to the culture and survival of the Gwich'in people. I call on you to reverse course immediately. Halt your plans to hand over the Arctic National Wildlife Refuge to Big Oil and begin protecting our wilderness and climate instead. If you do not, I will stand strong with NRDC -- both in and out of court -- to defend our natural heritage from your reckless assault.